Indo-Russian joint venture supersonic cruise missile BrahMos is all set to go for maiden air launch later this week. Defence sources said the BrahMos Aerospace had to reduce the weight of the air version of the missile to 2.4 tonne as it is to be launched from a moving platform unlike its land and navy versions. 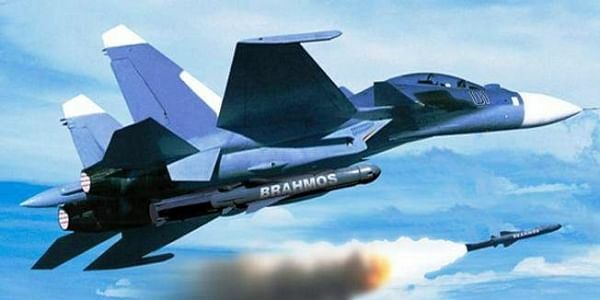 BHUBANESWAR: Indo-Russian joint venture supersonic cruise missile BrahMos is all set to go for maiden air launch later this week. The nuclear capable world class weapon system will be fired from Sukhoi-30 MKI aircraft over the Bay of Bengal. Defence sources said this will be first live test flight of the missile from an air-based platform. The missile has been successfully integrated with the launcher. If test fired successfully, BrahMos will be first cruise weapon system in the world to have such capability of being fired from all three platforms – land, sea and air. A team Russian defence scientists are camping here along with the scientists of BrahMos Aerospace Limited and all are expecting a copy book launch. The 8.4 meter BrahMos missile, fastest in the world, has a flight range of 450 km (enhanced from 290 km following India's entry in Missile Technology Control Regime) and carries a conventional warhead up to 300 kg. With high-precision and devastating power it can cruise at the supersonic speed of Mach 2.8. Defence sources said the BrahMos Aerospace had to reduce the weight of the air version of the missile to 2.4 tonne as it is to be launched from a moving platform unlike its land and navy versions. The weight of land and naval versions of the missile is 2.9 tonne. Some modifications were also made in its design to easily integrate it in Sukhoi aircraft. “Some structural changes were made to the Sukhoi by Hindustan Aeronautics Ltd (HAL) for the finest integration of the heavy missile. The design changes have been validated through various tests including the critical ground vibration test,” the source added. Equipped with inertial navigation system and global positioning system, it can effectively engage ground targets from an altitude as low as 10 meters for surgical strikes at terror training camps across the border without causing collateral damage. BrahMos is the only supersonic cruise missile possessing this advanced capability in the world providing an edge to the user with precise hit. The Army and Navy have already inducted the missile system. After some flight trials it will be inducted in the air force.